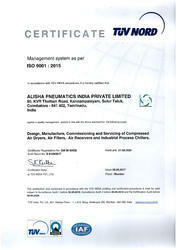 Established in the year 2010, "Alisha Pneumatics", are counted amongst one of the highly progressive companies engaged in manufacturing, supplying, importing, exporting a wide gamut of Air Dryers, Air Cooler, Air Filters and Air Filter Parts. We also offer the maintenance and installation support for our offered range. We are importing Air Purification product components from German, Turkey, China & Malaysia. These products are manufactured by our experienced professionals using high grade raw material that is procured from some of the authorized vendors of the industry. Our comprehensive product range is appreciated by valuable clients for its unrivaled features like precision performance, thermal resistance and corrosion resistant finish. These products are efficiently catering to diverse industrial applications. We are assisted by our team of professionals and well-established manufacturing unit that enable us to fabricate high quality product range. The infrastructure facilities of our organization are handled by our team of professionals. We also export our products to different parts of the world, some of the countries where we export our products are Sri Lanka, Bangladesh and Malaysia. The team members recruited by us are well-versed in their assigned tasks and work in close coordination to effectively meet the ultimate aim of organization of total client satisfaction. Further, in order to meet the requirements of our clients, we also provide a customized product range. Owing to the high quality standards of our product range, we have created huge client base across the country. We have created a unique position of ourselves in the industry that has further enabled us to expand our customer base. 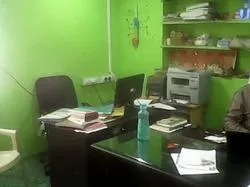 Under the strong motivation and vast experience of our manager "Mr. B. Prabakaran", we have been able to achieve a remarkable reputation in the industry. Our consistent efforts and strong determination helps us to maintain the superior quality of our product line. We have recruited a team of highly skilled professionals, who are very passionate towards their work and direct their endeavors to meet the prescribed goals of our organization. These professionals are hired through rigorous recruitment procedures and hold immense experience and understanding of the industry. Their untiring efforts and skills empower us to provide utmost quality products to our clients in prompt manner. They work in close-coordination with each other, which help us smoothly and timely carry out all our business activities. Our technologically advanced infrastructural facility enables us to manufacture and supply optimum quality range of Air Dryers & Drain Valves. This unit is equipped with all the latest machines and designing equipment requisite for the fabrication of our product range. 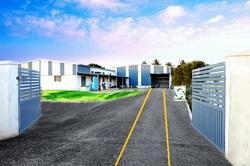 Spread over wide area, this unit comprises various functional sub-units and empowers us to produce the bulk quantities of these products in smooth and systematic manner. 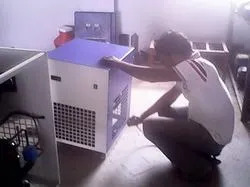 These units are manned with an adept team of technocrats, who are familiar with the functionality and operations of all the installed machinery. We are the leading manufacturer and supplier of a wide range of Air Dryers & Drain Valves.